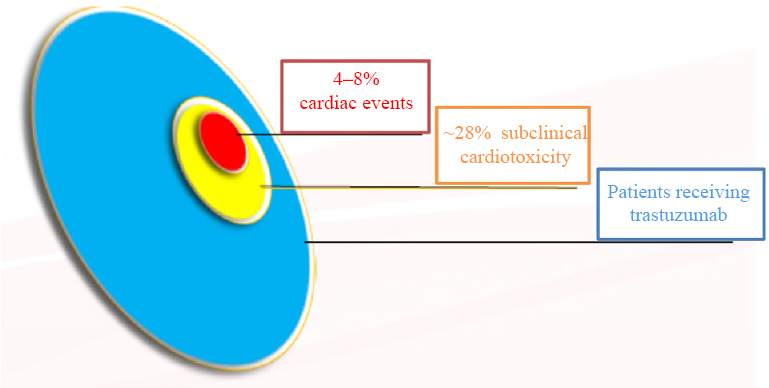 Background: Cardiotoxicity is a toxic side effect of trastuzumab-based therapy. Current guidelines for cardiac monitoring (every 3 months) in patients with human epidermal growth factor receptor 2 (HER2)-positive breast cancer receiving trastuzumab-based therapy have been dictated by the increased risk of cardiotoxicity observed in clinical trials. However, the majority of these patients are at a low risk of cardiac complications and may not require such frequent monitoring. Objective: This randomized controlled clinical trial will be performed to demonstrate that cardiac monitoring (echocardiography (ECHO)/multiple gated acquisition scan (MUGA) every 4 months is not inferior to every 3 months in the detection of cardiac dysfunction (decrease in left ventricular ejection fraction (LVEF)) in patients receiving trastuzumab-based therapy for early-stage HER2-positive breast cancer. Study period: From June 2016 to December 2018. Study location: The Ottawa Hospital Cancer Centre. Principal investigator: Dr. Olexiy Aseyev and Dr. Susan Dent at Department of Medicine, Division of Medical Oncology, The Ottawa Hospital, University of Ottawa, Canada. Study design: A prospective, single-center, randomized controlled non-inferiority clinical trial. Study population: A total of 200 patients with early-stage HER2-positive breast cancer (n = 100 in each group) receiving trastuzumab-based therapy will be enrolled. Inclusion criteria: Patients with histologically confirmed early-stage HER2-positive breast cancer receiving trastuzumab-based therapy, who are over 18 years of age, have a normal baseline LVEF (> 53%) and are able to provide verbal consent will be included in this study. Exclusion criteria: Patients will be excluded if they have any contraindication to transthoracic echocardiography or MUGA. Randomization: Eligible and consented patients will be randomized using a permuted block design to receive cardiac evaluation (by either transthoracic echocardiography or MUGA) every 3 months, or every 4 months while on treatment, 100 patients for each type of cardiac evaluation. Primary outcome measure: The rate of changes in LVEF diagnosed by ECHO or MUGA throughout trastuzumab-based therapy in both groups. Secondary outcome measures: Rates of trastuzumab delay/discontinuation, referral to cardiology, rate of cardiac events. Human specimen collection: Not involved. Ethical approval: This study was approved by the Ottawa Health Science Network Research Ethics Board. Trial registration: ClinicalTrials.gov identifier: NCT02696707 on February 18, 2016. Study status: This study is currently recruiting participants. Study enrolment is expected to be completed by July 2018 and analysis of primary outcome measure will be completed by October 2018 and the study will be completed by December 2018. Discussion: This study will present data on the cardiac safety of less frequent cardiac monitoring in patients with early-stage HER2-positive breast cancer. Future trials will explore cardiac monitoring strategies using composite data including baseline cardiac risk factors, baseline cardiac imaging and cardiac biomarkers. Health care economics will be explored. One year of trastuzumab-based therapy is widely accepted as the standard of care for women with early-stage HER2-positive breast cancer. However, retrospective analyses of adjuvant trials have demonstrated an increased risk of cardiotoxicity (heart failure in 4–8% of NSABP B-31) in a small number of patients [Figure 1]. Currently, there are no validated tools to predict which patients will develop cardiac-related complications from trastuzumab-based therapy. Left ventricular ejection fraction (LVEF), measured with transthoracicechocardiography or multiple gated acquisition scan (MUGA)4, has traditionally been used to assess cardiac function in patients receiving potentially cardiotoxic systemic therapy, however, neither the optimal type of cardiac imaging or its frequency is known. While national and international treatment guidelines recommend cardiac imaging every 3, or 4 months during adjuvant trastuzumab therapy, there is a lack of evidence supporting a defined cardiac monitoring schedule. Figure 1: Cardiotoxicity rates among breast cancer patients receiving trastuzumab-based therapy. ECHO: Echocardiography; MUGA: multiple gated acquisition scan. To the best of our knowledge, no clinical trial has prospectively compared the two most commonly used frequencies of cardiac monitoring (i.e., 3 vs. 4 months). Determining the optimal imaging strategy could streamline the management of patients receiving potentially cardiotoxic therapy, improve patient's quality of life, and potentially reduce cost to the health care system without compromising safety or efficacy of cancer treatment. 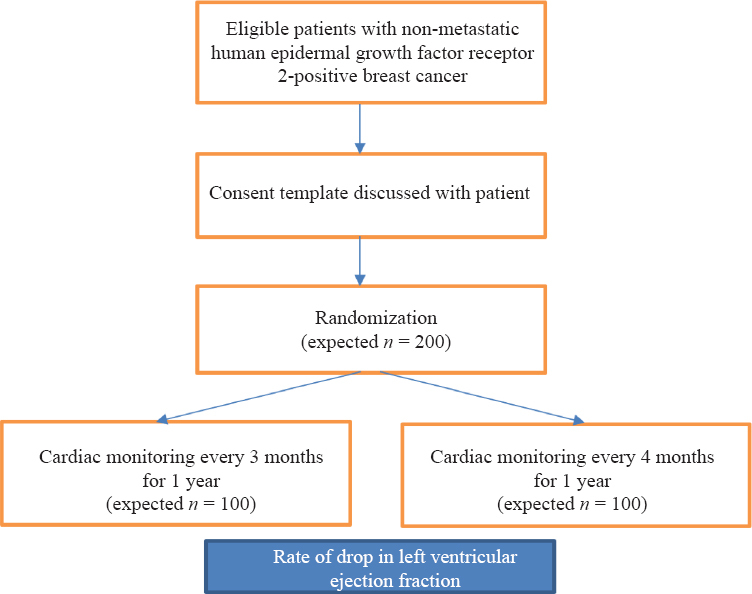 The primary objective of the current study is to demonstrate that cardiac monitoring (echocardiogram(ECHO)/MUGA) every 4 months is not inferior to every 3 months in the detection of cardiac dysfunction (decrease in LVEF) in patients receiving trastuzumab-based therapy for early-stage breast cancer [Figure 2]. Secondary objectives include changes in LVEF, delay or discontinuation of trastuzumab therapy, referrals to cardiology and feasibility of study physicians using an integrated consent model to enter patients in this study. Figure 2: Timeline of cardiac monitoring schedules with expected rates of cardiotoxicity over time. The development of the REaCT program for comparing standard of care interventions is outlined elsewhere8. Essentially the key components include: selection of clinically relevant and practical questions; demonstration of clinical equipoise through surveys of knowledge users and completion of systematic reviews; simply defined study endpoints and avoidance of superfluous data collection; use of an integrated consent model (ICM) incorporating oral consent9; efficient REB approval10; web-based randomization in the clinic and the use of real-time electronic data capture. This is a prospective single-center randomized clinical trial (React-EF study), which focuses on optimization of cardiac monitoring once schedule. This study is designed to include 200 patients with stage I–III breast cancer receiving (neo)adjuvant trastuzumab-based therapy at The Ottawa Hospital Cancer Centre between June 2016 and July 2018. The main objective of this study is to demonstrate the safety of cardiac monitoring every 4 months versus every 3 months. The rates of changes in LVEF diagnosed by ECHO or MUGA throughout the course of trastuzumab-based therapy in both groups will be the primary clinical outcome for this study. The results of this study will be used to define optimal cardiac monitoring strategies for this patient population. This study will use a novel method to allow comparisons of established standards of care for cardiac monitoring using the “integrated consent model” as part of a pragmatic clinical trial. By integrating medical and clinical practices, physicians will be able to inform their patients about the randomized clinical trial, akin to a typical conversation between the physician and patient, without written informed consent. This clinical interaction would then be documented, as ordinarily done in clinical practice. This study protocol was approved by the Ottawa Health Science Network Research Ethics Board (approval number: OHSN-REB 20150777-01H). The study will be performed in accordance with the Declaration of Helsinki, and informed consent will be collected from each study participant prior to enrollment. Paper writing and modification comply with the Guidance for Protocols of Clinical Trials (SPIRIT checklist). Patients with histologically confirmed early-stage HER2-positive breast cancer receiving trastuzumab-based therapy for early-stage breast cancer, who are over 18 years of age, have a normal baseline LVEF (> 53%) and are able to provide verbal consent (Additional file 1) [Additional file 1] will be included in this study. Patients will be excluded if they have any contraindication to transthoracic echocardiography or MUGA. The Ottawa Hospital Cancer Centre sees about 1,000 patients per year with stage I–III breast cancer and about 10 to 15 patients per month would meet the study inclusion criteria for this study. We plan to recruit 200 patients over 18 to 24 months, or approximately 10 to 12 patients per month. Eligible and consented patients will be randomized using a permuted block design to receive cardiac evaluation (by either transthoracic ECHO or MUGA) every 3 months, or every 4 months while on treatment. We will randomize participants using a web-based system developed by the Methods Centre at The Ottawa Hospital. Each site investigator will have the web-based randomization system short-cut uploaded to their device in order to randomize participants. The physician must dictate that the verbal consent and eligibility review has taken place prior to randomization. The investigators will then forward the randomization confirmation email indicating the selected cardiac monitoring schedule to the local study clinical research associate. Stratification will be performed for anthracycline and non-anthracycline-based chemotherapy. Screening and randomization logs will be kept on file. We anticipate this study will demonstrate the non-inferiority of 4 versus 3 months of LVEF monitoring in two independent groups with our non-inferiority margin of 4%. The primary clinical outcome for this study will be the rates of changes in LVEF diagnosed by ECHO or MUGA throughout the course of trastuzumab-based therapy in both groups. Based on calculated sample size we expect to enroll 100 patients in each group [Figure 3]. Figure 3: Study flow diagram. Secondary clinical outcomes include: 1. Rates of trastuzumab delay/discontinuation; 2. referral to cardiology; 3. rate of cardiac events. 1. Percentage of patients who receive trastuzumab therapy for early-stage breast cancer compared to the number of participants who agree to randomization. The total number of patients receiving adjuvant trastuzumab at each site will be provided by pharmacy. 2. Percentage of participants who complete their assigned cardiac monitoring schedule compared to the percentage who discontinue their cardiac monitoring schedule while on study (compliance) will be calculated using the medical record. 3. Percentage of medical oncologists who attend the site initiation visit and agree to participate in the trial compared to the percentage of medical oncologists that actually approach patients regarding the trial. At the Ottawa Hospital Cancer Centre, patients are assigned to a primary medical oncologist. Therefore, all approached patients will have their primary oncologist documented on the medical record, which will be compared to the list of all oncologists agreeing to participate in the trial. Recruitment will take place from June 2016 to July 2018. Each participant will be enrolled in the study for approximately 13 months in total (screening, 12-month treatment, neither observational period nor post-treatment follow up is required). The timeline with details of the cardiac monitoring schedules is summarized in [Figure 2]. As per protocol, one of the outcome points will be change in LVEF throughout the course of trastuzumab-based therapy (> 4%) in both groups. It is known that normal LVEF is > 53% (average – 61% with standard deviation 8%). In adjuvant clinical trials, many patients during trastuzumab-based treatment experienced a reversible decrease in LVEF of between 4–6%. As a criterion of non-inferiority, the mean of last measured LVEF while on trastuzumab treatment can be used to prove the same safety and sensitivity of both schedules. Our non-inferiority margin between groups is 4% (MLVEF3 months– MLVEF4 months < ± 4%) with a standard deviation of the mean change of 8%. To demonstrate non-inferiority of 4 versus 3 months of monitoring mean LVEF in two independent groups with t tests (Means: Difference between two independent means) and our non-inferiority margin of 4%, we require 87 patients in each group – total 174 +10% (drop rate) = 200 [Figure 2]. We assumed a significance level α = 0.05, power (1–β) of 95%, and effect size d = 0.5 (G*Power 3.1.9.2.). All data will be collected using a specially developed web-based secure electronic case report form system. Participants will be randomized using a web-based system developed by the Methods Centre at The Ottawa Hospital, Canada. Stratification will be performed for anthracycline and non-anthracycline-based chemotherapy. Descriptive analysis: Baseline characteristics and management data will be presented with means (continuous measures) or proportions (categorical or ordinal data) with 95% confidence intervals. Intention-to-treat analysis: In both studies, all statistical analyses of the data will be based on an intention-to-treat approach (based on subjects who underwent randomization). In addition, a treatment received as per protocol analysis of the primary outcome measure will be conducted. Analysis of the primary outcome (LVEF): The primary outcome (LVEF) will be measured at baseline and every 3 or 4 months with the primary (and common) time point measure at 1 year. As the primary outcome is a continuous variable, the mean difference between both treatment groups at 1 year of follow up and the last measured LVEF while on trastuzumab treatment will be assessed using repeated-measures analysis of variance, which control for study sites (random effect) and eventually control for differences in confounding variables, should any arise despite randomization. The purpose of our model is not inferential, but rather to estimate the expected change in treatment effect and confidence interval, i.e., whether or not the 4 monthly group is found to be inferior by non-inferiority by a margin of 4%. Analysis of secondary feasibility and clinical outcomes: Secondary feasibility outcomes will be reported using descriptive statistics. Protocol adherence will be reported as a proportion. Dichotomous clinical outcomes will be compared using a one-sided Z-test while continuous variables will be compared using a one-sided t-test in an analogous manner. Relative risk (dichotomous) and mean differences (continuous) along with their 95% confidence intervals will also be calculated and presented. Secondary analyses will be considered to better understand the influence of compliance, and losses to follow-up on the robustness of the intention-to-treat analysis. The general approaches will include an analysis of primary and secondary outcomes including only participants who completed the study as per their assigned diagnostic schedule protocol. 2) Over 50% of physicians who agree at study commencement to participate in the study do indeed approach patients for the study. Prior to study commencement and at study closure, all of the medical oncologists who treat breast cancer patients will be sent an email requesting feedback on their enthusiasm for the study and how they feel optimal methods of patient accrual can be incorporated into the feasibility of this study. The majority of patients receiving trastuzumab-based therapy for early breast cancer will not experience clinically significant cardiotoxicity (i.e., heart failure). However, national and international treatment guidelines recommend cardiac imaging every 36,7 or 45 months during adjuvant trastuzumab therapy. Published guidelines acknowledge a lack of evidence supporting a defined cardiac monitoring schedule. Interestingly, a recent study, using SEER data, showed that only 36% of older patients (> 65 years old) with early-stage breast cancer treated with trastuzumab received cardiac monitoring according to the NCCN guidelines. Cardiac imaging significantly increases cost to the health care system and can reduce the patient's quality of life as it requires repeat visits to the cancer centre. This pragmatic clinical trial will assess the non-inferiority of cardiac monitoring every 4 months versus every 3 months in patients with early breast cancer receiving trastuzumab based therapy. Future trials will explore cardiac monitoring strategies using composite data including baseline cardiac risk factors, baseline cardiac imaging and cardiac biomarkers. Health care economics will be explored. Additional file 1: Consent Script. We are grateful for patients and their families for their assistance with this study, as well as physicians for approaching patients. This study was conceived and designed in collaboration between SD, JS, OA, MC, DF, CS, CJ, LV, and SM. The paper was drafted by OA. All authors participated in revision of the paper and approved the final version of this paper prior to publication. This study protocol was approved by the Ottawa Health Science Network Research Ethics Board (OHSN-REB 20150777-01H). The study will be performed in accordance with the Declaration of Helsinki, and informed consent will be collected from each study participant prior to enrollment. Paper writing and modification comply with the Guidance for Protocols of Clinical Trials (SPIRIT checklist). ClinicalTrials.gov identifier: NCT02696707; registered on February 18, 2016. Tan-Chiu E, Yothers G, Romond E, et al. Assessment of cardiac dysfunction in a randomized trial comparing doxorubicin and cyclophosphamide followed by paclitaxel, with or without trastuzumab as adjuvant therapy in node-positive, human epidermal growth factor receptor 2-overexpressing breast cancer: NSABP B-31. J Clin Oncol. 2005;23:7811-7819. Romond EH, Perez EA, Bryant J, et al. Trastuzumab plus adjuvant chemotherapy for operable HER2-positive breast cancer. N Engl J Med. 2005;353:1673-1684. Seidman A, Hudis C, Pierri MK, et al. Cardiac dysfunction in the trastuzumab clinical trials experience. J Clin Oncol. 2002;20:1215-1221. Plana JC, Galderisi M, Barac A, et al. Expert consensus for multimodality imaging evaluation of adult patients during and after cancer therapy: a report from the American Society of Echocardiography and the European Association of Cardiovascular Imaging. J Am Soc Echocardiogr. 2014;27:911-939. Jones AL, Barlow M, Barrett-Lee PJ, et al. Management of cardiac health in trastuzumab-treated patients with breast cancer: updated United Kingdom National Cancer Research Institute recommendations for monitoring. Br J Cancer. 2009;100:684-692. Curigliano G, Cardinale D, Suter T, et al. Cardiovascular toxicity induced by chemotherapy, targeted agents and radiotherapy: ESMO Clinical Practice Guidelines. Ann Oncol. 2012;23 Suppl 7:vii155-166. Network NCC. NCCN Clinical Practice Guidelines in Oncology (NCCN Guidelines)®: Breast Cancer Version 2.2015. National Comprehensive Cancer Network, Fort Washington Accessed. 2015;11. Hilton J, Mazzarello S, Fergusson D, et al. Novel methodology for comparing standard-of-care interventions in patients with cancer. J Oncol Pract. 2016;12:e1016-1024. Kim SY, Miller FG. Informed consent for pragmatic trials--the integrated consent model. N Engl J Med. 2014;370:769-772. Sugarman J, Califf RM. Ethics and regulatory complexities for pragmatic clinical trials. JAMA. 2014;311:2381-2382. Chavez-MacGregor M, Niu J, Zhang N, et al. Cardiac monitoring during adjuvant trastuzumab-based chemotherapy among older patients with breast cancer. J Clin Oncol. 2015;33:2176-2183.